Many countries require that your passport be valid for at least six months from your return date. 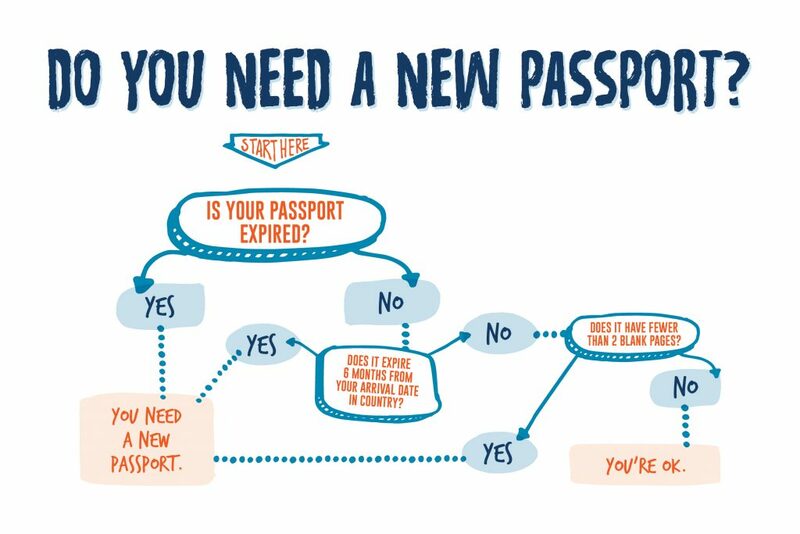 If you’re leaving soon and your passport is set to expire before then, it’s time to get it renewed. Below is some helpful information to help you get a U.S. passport in two weeks or less. It takes two to three weeks to renew an expired or expiring passport by mail when you pay an extra $60 to expedite it. This expedited fee is added to the renewal fee cost ($105 for 15 and younger, $110 for 16 and older). You’ll need to drop your application off at a passport acceptance facility, like a local post office or library. It will arrive in two to three weeks, if you pay the $60 expedite fee, in addition to the general application fee ($105 for 15 and younger, $135 for 16 and older). If you live near a regional passport agency, you can apply for your first passport or renew an expired or expiring one in person. The estimated processing time is eight days. Some reports indicate that it can even be done in less than 24 hours! Find your nearest passport agency. Schedule an appointment online. You can also call the call the National Passport Information Center at 1-877-487-2778 to schedule an in-person appointment. If there aren’t any appointments before your trip, go to the office and stand in line. It could take a while. Fill out form DS-11 online to print or print a PDF to fill out by hand ahead of time. Make copies of the front and back of your citizenship evidence, like your birth certificate, and government-issued photo ID, like a driver’s license, on separate 8.5×11 pieces of paper. (A current, undamaged passport will work for both.) You must bring both to your appointment. Print out your travel documents (your e-ticket confirmation) that prove you’re leaving in less than two weeks. Bring two photos of yourself. You can get passport photos at your local pharmacy, or you can take one at home. But no selfies! Here are some photo examples and a video with instructions. Head to your appointment! Don’t forget your completed application, copies of your citizenship doc, photo ID, travel docs, passport photo, and credit card, checkbook, or exact cash. Passport agencies take all forms of payment. Here’s the fee chart. Get your passport and have an incredible adventure! If you don’t live near a passport agency, try calling the National Passport Information Center for more information. You may have to hire a third-party expeditor, which can cost up to $500. They’re the ones that come up when you google something like “how to get a passport quickly,” but be wary. Editor’s Note: This post was originally published in May 2017 and has been updated to reflect current information. Traveling with Rustic Pathways and still have questions? Click below to schedule a call with a Global Program Advisor. This team of travel experts has worked in multiple countries with Rustic in roles that range from leading programs to running our in-country operations and can help you find the perfect trip.